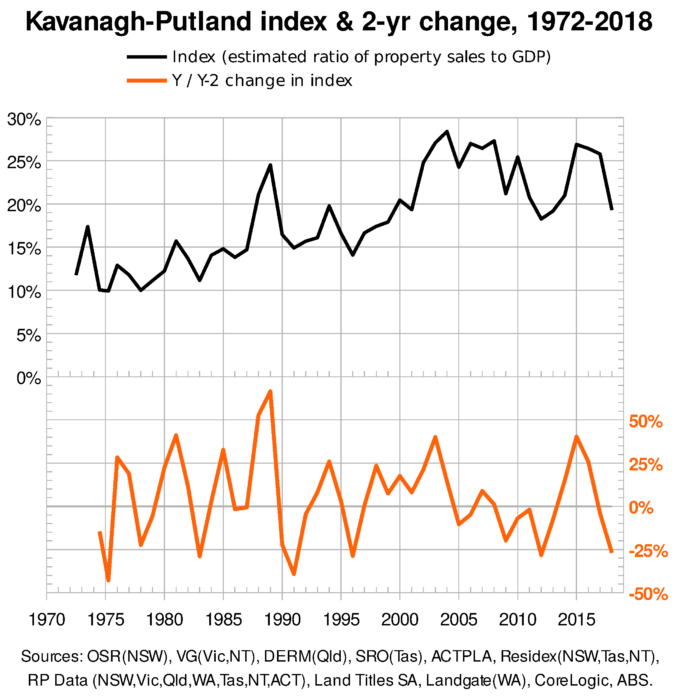 The “Kavanagh-Putland Index” (KPI-2009) measures Australia’s estimated total real estate sales as divided by its GDP. It has proven to be a simple yet effective predictor of economic recession, whether in its earlier life as the “Barometer of the Economy” (1991) which had included unadjusted calendar-year sales in the case of Victoria, or in its reincarnated KPI form as produced by Dr Gavin Putland. The effect of Putland’s adjustment of Victorian sales to financial years has been to move the notional real estate bubble line from 19%, towards 15%. (For those interested in the Kondratieff wave, the upward trend in the index actually reflects the downward half of the current K-Wave.) The 2-yearly change in the index has now crossed the damning -25% line in 2018, and presages economic recession in the 2019-20 financial year. Together with Dr Putland’s “Trickle-up chart”, the KPI is a unique graph in the world of economics, underpinning the case for economic reform argued by Prosper Australia. Although the KPI has been picked up by independent and heterodox financial analysts, it appears mainstream media is avoiding it because it essentially points to the need for greater capture of economic rent and less reliance on taxing wages. It represents a major challenge to banking and wealthy rent-seeking interests, even though it has been advocated by classical economists from Adam Smith, David Ricardo, John Stuart Mill and Henry George to modern economists such as Mason Gaffney, Michael Hudson and Fred Harrison. This might be quite a change, but we were there in the Progressive Era (1890-1920), when land-based ‘taxes’ (economic rents) were some 50% of all taxation and income taxes were less than 10% – and we could gradually get there once again. The state of today’s world economies clearly attests to the fact it’s time to implement the 2010 recommendations of Australia’s Future Tax System, the “Henry Tax Review”. If Australia were to do so, it might again lead the world in economic justice, as once it did, along with New Zealand. “There’s not enough economic rent”? Nonsense! say cases put by John Locke to Mason Gaffney and Joseph Stiglitz which show that taxes come out of rent anyway, so why not put the charge there in the first instance, without all the deadweight loss the world has experienced through private rent-seeking? No? – Pray tell why not? Previous PostKAVANAGH-PUTLAND INDEX POINTS TO A RECESSIONNext Post‘Capitalism’?